Your resource for all things shoegaze and dream pop: ALBUM REVIEW: Pinkshinyultrablast | Miserable Miracles. Reviewed by Elizabeth Klisiewicz. 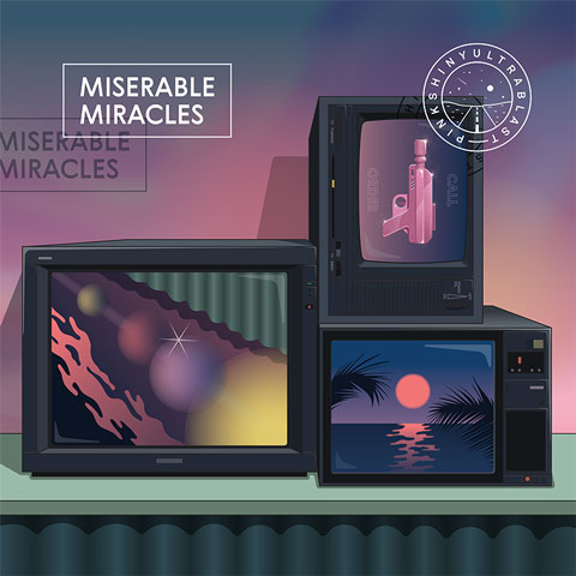 ALBUM REVIEW: Pinkshinyultrablast | Miserable Miracles. Reviewed by Elizabeth Klisiewicz. These quirky, critically acclaimed dream-gazers from St. Petersburg have made a real splash on the scene over the past several years due to a series of excellent releases and a fresh take on the old shoegaze sound. Rather than retreading the tired MBV/Slowdive ground followed by so many other acts, these folks have employed a delectable melange of sparkling synth pop and ambient cool meshed with sprightly melodies. Singer Lyubov’s lilting high soprano soars above the shimmering sonic textures, enchanting the listener from start to finish. Witness the album opener “Dance AM” with its throwback sound and a clean, chill vibe. It’s the ultimate of cool and underscores the shift in the band’s sound. It skitters effortlessly into the lush electronica of “Triangles” and moves through to one of the singles, the lovely “Find Your Saint”. I might be inclined to conjure up a bunch of purple prose to describe the majesty of these songs, throwing in butterflies and buttercups in a high meadow, but I will leave that to other scribes. “Eray” is pure retro, flashing me back to the late 80s music that crowded my collection, from Depeche Mode over to OMD. It’s such a perfect melange of past and present, with updated textures and refined recording techniques. And all of it’s wrapped in ear candy that will sweeten your day for sure. “Blue Hour” is an unexpected ambient treat, with minimalist tones and a cosmic vibe that will send you straight into orbit. “Earth and Elsewhere” is the perfect soundtrack for late night listening, and I love how rippling synths enhance this chilled out instrumental. “Taleidoscope” has glimmers of A Sunny Day in Glasgow and School of Seven Bells but maintains the unique, somewhat exotic stamp of a band breaking new ground. “In the Hanging Gardens” is the first song I heard from this album, and it’s a winner and good choice for a single. Finally, “Looming” is pure, fuzz-drenched shoegaze meshed with dreamy interludes. A terrific end to a beautifully rendered work of musical art.